Shadow Foreign Secretary Emily Thornberry calls for “timely and effective” new elections in Venezuela and “targeted sanctions”. Left needs to say more than this, and Thornberry has said it. This was posted today on John McDonnell – The People’s Chancellor. Thornberry: Labour will not tolerate abuses by ‘socialist’ regimes Guardian. Shadow foreign secretary will make clear rebuke to record of Venezuela’s Nicolás Maduro. A Labour government would not indulge human rights abuses by Britain’s allies or by regimes that “call themselves ‘socialist’ but … betray every socialist ideal”, the shadow foreign secretary will say on Wednesday. The reference by Emily Thornberry, when she sets out her proposed policy under a Labour government, is intended as a clear rebuke to the record of the Venezuelan government led by Nicolás Maduro. JeremyCorbyn has so far opposed the decision made by a majority of European Union states, including the UK, to recognise the rival Venezuelan leader Juan Guaidó as interim president, but Thornberry is eager to ensure that Labour’s opposition to interference is not misconstrued as support for the Maduro regime. Guaidó’s party is a member of the Socialist International, with which Labour is affiliated. The key themes of Thornberry’s speech at the Institute for Government setting out her vision of a Labour foreign policy will inevitably draw parallels with the ethical foreign policy set out by Robin Cook as the first foreign secretary of Tony Blair’s 1997 government. This is an extremely welcome move. Unlike many, who have suddenly become experts on Venezuela, this Blog has been reluctant to comment on the crisis in the country. Venezuela's economy is in free fall because of falling oil prices and US sanctions, not socialism. Here I examine the country's economy & politics since Chavez. This is the context, and these are the facts, the media doesn't give you. It would seem that the only thing keeping Maduro supporters going in Britain is the fact that Trump and most of the EU (with exceptions like Italy’s far-right/populist government, “Italy has vetoed an EU statement on the Venezuela crisis amid political confusion in Rome“.) is against him. It is as plain as a pikestaff that the Maduro regime is not just on the skids, but that 3 million people have fled Venezuela, and that the corrupt Chavista government has remained in power through the use of force – including the torture of opponents. There is a steady drip drip of stories such as this: how pro-regime millionaires have been salting their stolen cash away in foreign banks. It is not necessary to go further to agree that Emily Thornberry has the right approach, from first principles, on how to deal with this issue. Here is what she has just said, (Belfast Telegraph). Shadow foreign secretary Emily Thornberry called for timely elections but declined to recognise Venezuela’s opposition leader as interim president. …in a break with Labour leader Jeremy Corbyn, Ms Thornberry backed the use of targeted sanctions and “whatever means necessary” short of a military invasion to bring about change. Ms Thornberry told an event at the Institute for Government in London on Wednesday: “What I am saying is that we begin with dialogue. She added: “That’s the best way to proceed rather than somebody saying ‘that’s it, we’ve had enough, we recognise X, we don’t recognise Y any more’. Ms Thornberry said she was a “great believer in sanctions” as a way of using foreign policy muscle “that doesn’t involve killing people”. She said there should be “timely and effective” new elections in Venezuela but “there should be no invasion, there should be proper discussion and negotiation”. Tagged with Imperialism, Internationalism, Labour Party, Maduro, Venezuela. Venezuela: For the Left is Defence of Maduro, Dialogue or Criticism, the Answer? This was on Newsnight yesterday: Evan Davis speaks to Juan Andrés Mejía, founding member and National Director of one of the main Venezuelan opposition parties, Popular Will (Voluntad Popular, a “centrist social democratic party”). This statement has caused controversy and there is little doubt that many critics of it do so in bad faith. I will restrict comment to one point. If Macron has indeed called for dialogue in Venezuela, his appeal has not been widely reported in the French media. A search reveals that he suggested that he offered his services in the role of mediator. France’s Macron pushes for mediation role in Venezuela 4th of August. The French language media is pretty near silent on this but you can find that, “La lettre écrite de la main d’Emmanuel Macron a été envoyée le 5 juillet à Nicolas Maduro” – a letter written by Emmanuel Macron was sent on the 5th of July to Nicolas Maduro (Venezuela : Macron a envoyé une lettre à Maduro pour tenter d’aider le pays à sortir de la crise). I may well be proved wrong but Le Monde certainly has not found this story worthy of recent coverage and there was certainly no major “call today” as the Corbyn statement suggests: here. We wait for a reply from Maduro to Macron. George Galloway ridicules Venezuela dictatorship claims: ‘They’ve won more elections than anyone in history’. George Galloway has rubbished the idea that Venezuela is sliding into dictatorship, saying the country’s Socialist regime has won more elections than any other regime in history. The country’s constitution is to be redrawn following a recent election, and there are fears that President Nicolas Maduro will gain a raft of new powers – fears exacerbated by the recent arrest of two leading opposition activists. Turning to the specific allegations against the Venezuelan regime, Galloway said “the government of Maduro, and before him Chavez, has won more elections than anybody in all of human history. George Galloway: Venezuela critics are just Blairites having a kick at Jeremy Corbyn. Galloway said: “I keep hearing half-witted, uneducated pontificators who know nothing about the country, lecturing us on how Venezuela has taken such a wrong turn. “When I heard the interview about it on this station, in this very studio room with Ken Livingstone, I realised we had to take a stand. “What’s really going on here is not an attack on Maduro, who these pontificators had not heard of before last week, couldn’t identify his mug on a mugshot on a TV screen. This is another assault on Jeremy Corbyn. “Labour MPs, many of them admirers of Tony Blair, many of them supporters of the Iraq War, many of whom abstained on a three-line whip to ask for an inquiry into the selling of deadly weapons to the putrid dictatorship of Saudi Arabia, are demanding that Corbyn denounce his erstwhile friends in Venezuela. Galloway went on to suggest that, “if only Venezuela had hired one of Tony Blair’s PR machines in London town, they might be in a better place as far as the British mainstream media is concerned. Turning to the cause of the current crisis, Galloway said it has been “fuelled by the United States, not in the last few weeks or months but since 1998. “Nineteen years the United States government and its secret agents have been trying to overthrow the Venezuelan political protest. Rightist Labour MPs busted exploiting Venezuela for a shot at Corbyn. As anyone who follows the news even tangentially will be well aware, the latest ‘weapon of mass desperation‘ used to attack Labour’s hugely-popular leader is a country. To feeble and flailing right-wing media and MPs, the complex troubles of a whole nation have been reduced to little more than a hammer to try to land a blow on Jeremy Corbyn. But the new Venezuela APPG does little more than expose the motivations and lack of character of MPs who have joined it. Labour MPs Graham Jones, Angela Smith and John Spellar joined the group – but their former deputy leader spotted something interesting and called them out on it on Twitter. Now this may well be true but when will people answer serious left-wing criticisms of the Venezuelan regime? With the global fall in oil prices, Venezuela’s fifteen-year experiment in “petrol populism” seems to be winding to a close. Either the regime will collapse in short order, or it will maintain itself through increasingly bloody and repressive measures, as Maduro’s claim to represent the interests of the people grows even more tenuous. George Ciccariello-Maher, a seasoned apologist of Chavismo in the United States, writes in an article for Jacobin that the “enemies” are the ones who are out there “in the streets, burning and looting.” Socialists, he contends, should be supporting the recent state crackdown on the protesters, which has already left 130 or so dead. Socialists gain nothing by continuing to defend this bloated and incompetent regime. Even an oil-rich state like Venezuela cannot build “socialism in one country,” as the old Stalinist motto goes. Better to admit now what should have been obvious all along: Bolivarianism was a Revolution In Name Only, or #RINO for short (that acronym is still available, right?). Ni l’expropriation du capital par les travailleurs organisés, ni la destruction de l’appareil d’Etat existant, n’ont jamais été à l’ordre-du-jour au Venezuela sous la direction de Chavez. Neither the expropriation of capital by the organised workers, nor the destruction of the existing state apparatus, were ever on the cards in Venezuela under the Leadership of Chávez. La meilleure chose qui pourrait arriver au Venezuela, au contraire, serait une mobilisation indépendante de la classe ouvrière, des pauvres et des paysans, contre Maduro. The best thing that could happen in Venezuela is, by contrast, an independent mobilisation of the working class, the poor and the peasantry, against Maduro. The main problem on the left and in the workers’ movement, is the absence of a mobilisation in defence of the Venezuelan people, and therefore against Maduro. This is a repetition of the horrifying experience we saw with the Ukraine and above all with Syria. * 2017. Manchester Gorton. Parliamentary constituency. Galloway 5.7% , 2,615. Tagged with Hugo Chávez, Jeremy Corbyn, Labour Party, Maduro, Venezuela. The Tragedy of Venezuela, Michael Roberts: How Should the Left Respond? LABOUR MP Graham Jones declares that he would have “gone further” than shadow foreign minister Liz McInnes’s criticism of Venezuela. She demanded a response to concerns expressed by the “international community” about supposed authoritarianism and very real hardships affecting Venezuela’s people. This is presumably the US-led “international community” rather than regional states such as Bolivia, Ecuador and Cuba that have declared solidarity with Venezuela’s Bolivarian revolution. If Williamson is on the “wrong side,” it follows that Foreign Minister Sir Alan Duncan, Liberal Democrat leader Sir Vince Cable and Tory MP Mark Pritchard, who all attacked Corbyn for his silence, while on holiday, over Venezuela, must be on the right side. What would the Morning Star say about this? Criticizing Venezuela from the Left. ANDRÉS FELIPE PARRA 30 May 2017 Open Democracy. RAFAEL UZCÁTEGUI. May the 3rd. Just after the Sunday vote this declaration came out from a small Trotskyist group. ¡Contra el fraude constituyente redoblemos la movilización! ¡Fuera Maduro! (Unidad Internacional de los Trabajadores – Cuarta Internacional). El gobierno hambreador, corrupto y represivo de Maduro, consumó el pasado domingo un gigantesco fraude en alianza con el CNE. Au Venezuela, ce sont les travailleurs qui ont le droit de dire à Maduro : dégage ! 30th of July. 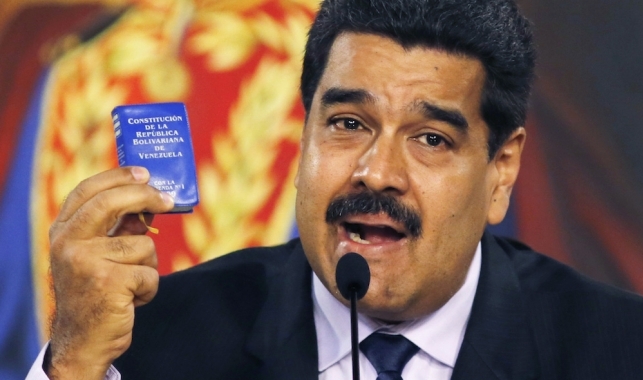 On May 1, Venezuelan President Nicolás Maduro signed an executive order to form a Constituent National Assembly to rewrite the country’s constitution. Predictably, Maduro’s right-wing opponents howled about a lack of respect for democratic rights and procedures, which they themselves routinely violated in seeking the overthrow of Chavismo. But many on the left see the latest move by the ruling Venezuelan United Socialist Party (PSUV) to consolidate its power as a dangerous further lurch toward authoritarianism. Here, we reprint a March 29 statement by Marea Socialista , which joined the PSUV when it was founded in 2007 by the late President Huge Chávez, but left it in 2015 in protest of the course set for the party by Maduro. The statement by Marea Socialista’s National Operations Team was first published in Spanish at the Aporrea website and appears here in a version edited by Todd Chretien of the English translation published at the Portal de la Izquierda website. How should the Labour Party respond? The country appears to be marching toward full-blown dictatorship. The demand that a politician “condemn” something is usually an exercise in political performance. It typically has no measurable impact beyond a minor point scoring exercise. But calls for Labour leader Jeremy Corbyn to condemn the government in Venezuela are different in one important respect. On seemingly good terms with the government of Nicolás Maduro, Corbyn’s words may actually carry weight in Venezuela. This is a matter of some importance when the country appears to be marching toward full-blown dictatorship. Demanding an apology from those who did not see the true nature of the Venezuelan government earlier on would be self-indulgent. It is also, for many, wildly hypocritical. Britain sells weapons to Saudi Arabia after all, another brutal dictatorship. Those getting on their high horse about Venezuela include admirers of Margaret Thatcher, whose relationship with Chilean tyrant Augusto Pinochet makes Corbyn’s relationship with the Venezuelan leadership look decidedly frosty. Yet Corbyn, who engaged in a cordial conversation with President Maduro over the telephone in 2014 for the television show En Contacto con Maduro, arguably has it in his power to influence developments in Venezuela. However small his influence might be, he ought to be calling publicly for the release of the political prisoners López and Ledezma. Supporters of Jeremy Corbyn like to say that their man has always come down on the “right side of history”. If this is to mean anything at all, then it should also mean speaking out against the abuses committed by one’s own side. Venezuela, Corbyn and Labour MPs Sacha Ismail. The Clarion. On 2 August the main headline on the front page of the Times read: “Labour MPs urge Corbyn to condemn Venezuela”! Labour MPs are using the crisis in Venezuela to have a fresh pop at Corbyn. No doubt some Labour MPs are genuinely concerned about human rights abuses in Venezuela. But the campaign as a whole is both bad politically and deeply hypocritical. I don’t say that because I am a fan of the Maduro government. I do not believe it is socialist – socialism or even a workers’ government can only be created by the self-organisation of the working class, not Bonapartist type populist regimes. Moreover in the recent period Maduro has taken an even more authoritarian turn, with many of the social gains made under the government of Hugo Chavez – also not socialist – now in danger (see this statement by Venezuelan socialist organisation Marea Socialista for a useful explanation). We should be supporting Venezuela’s beleaguered but substantial labour movement and particularly the wing of it critical of Chavismo from the left – not the government. But despite this and despite human rights abuses which are almost certainly taking place and getting worse – and which we should not be afraid to criticise – the dominant forces of the Venezuelan opposition do not represent a better alternative. Despite undoubtedly having some popular support, they are a right-wing, anti-democratic movement which is using popular dissatisfaction and supposed concern for democracy as a cover for its real agenda. They collaborate with a US government that has long sought to overthrow the “Bolivarian” regime for old-fashioned capitalist and imperialist reasons. 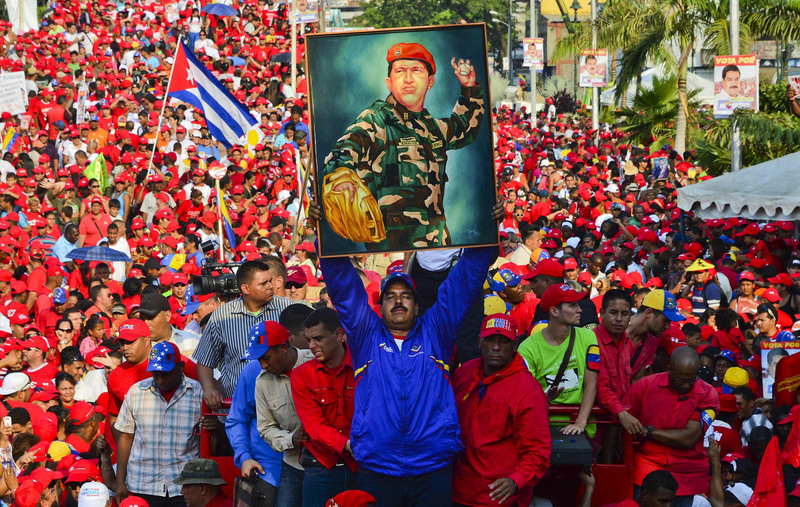 The current movement is the descendent, so to speak, of the right-wing coup against Chavez in 2002, which was defeated by mass popular mobilisation. The cause of democracy and the working class will be set back if it succeeds. We can also question to what extent many Labour MPs are motivated by genuine concern for democracy and human rights. They seem determined to ignore the fact that the Labour Party leadership has issued statements criticising the Venezuelan government (through shadow foreign office ministers Emily Thornberry and Liz McInnes, admittedly, not Corbyn – but Corbyn’s spokesperson has endorsed them). Is their problem that it is insufficiently enthusiastic about the right-wing Venezuelan opposition, or do they just not care about the facts at all? And in addition to the Labour right’s silence about the nature of the Venezuelan opposition, the right-wing MPs’ broader record speaks for itself. Many of those leading the charge against Corbyn on Venezuela broke the whip and abstained when the Labour Party pushed to end British support for the disgusting Saudi war in Yemen – something I am still genuinely slightly astonished by. Angela Smith, the All Party Parliamentary Group on Venezuela member quoted widely in the press today, is a case in point. (She also abstained on the Welfare Bill, in case you were wondering.) Such people support “democracy” as long it serves the interests of British capitalism and the Western powers. Labour MPs supporting Narendra Modi when he came to the UK was another shocking example. Perhaps Corbyn could do more to use his influence to stop human rights abuses by the Venezuelan government. I’m sure, judging by his previous statements, that he has illusions in Venezuela along with other “progressive”, “anti-imperialist” developing world regimes. That’s something The Clarion might look at in the near future. But this campaign to condemn him over Venezuela is fairly absurd and in many ways disgraceful. The point is not to condemn or support Jeremy Corbyn, and Sasha’s observations are certainly valid about the motives of those using this as a stick against the Labour Leader. This does not apply to one person, even the Leader, but to us all. Behind the present tragedy is, as Robert’s article indicates in detail, not just the dire economic condition of most people in Venezuela,but the key role of the Military, with “strong direct economic power”, and the “Maduro government elite” who have profited from the crisis. Does anybody seriously consider these forces to be the motors of a socialist ‘Bolviarian Revolution’ standing up bravely to a “200-family-strong plutocracy” that has to be defended against US Imperialism? Apparently the answer to that rhetorical question is, yes. The Communist Party of Britain has welcomed the results of last Sunday’s referendum in Venezuela to create a Constituent Assembly under article 347 of that country’s democratically adopted constitution. Robert Griffiths declared. ‘The elected government of Venezuela has made great strides in giving voice to the hitherto excluded and unrepresented, redistributing wealth from the rich to the poor – and it is our duty to defend it’. Tagged with Hugo Chávez, Jeremy Corbyn, Maduro, USA, Venezuela.